As we start a New Year, everyone is feeling introspective and striving to improve themselves and their surroundings. Fitness regimes, healthy eating and DIY are all on our to-do lists right now! We can’t help with the first two but if your skirting boards are looking a bit grubby read on for some advice on how to tackle these oft-overlooked but important household features. In theory, glossing should be a simple process but there are a number of considerations to ensure you have a great finish with do damage to the carpet or your furniture. Before you start, make a decision on any repairs prior to painting. Fill any cracks, corners, nail holes etc. with appropriate filler and allow to dry BEFORE painting. Avoid flat emulsion or the skirting boards will easily mark and get dirty much quicker. Opt for a satin-based paint instead if you’d prefer a subtle finish. Move furniture into the centre of the room so that you have space to work and cover with a dust sheet. Next, sand the skirting. Sanding is necessary to remove old paint, stripping it back so you are able to start from scratch. Sand the skirting board until you get a smooth finish. As a test, run your fingers along the surface and check to see if any rough edges remain. When you’re satisfied, vacuum and wipe with a damp cloth. Create a sugar soap solution with warm water and clean the skirting to remove grease or dust, and allow to dry completely. Lay newspaper or dust sheets on the floor to protect against spills. Stick a strip of masking tape along the edge of the carpet or floor covering, as close to the skirting as possible. If you are not confident in cutting-in at the top of the skirting, then gently apply masking tape to the wall as well. Tuck the cardboard under the skirting as further protection. Whilst an undercoat is more time consuming, it can bring much better results and experience favours this method. If the skirting boards have been glossed several times, they may need stripping, treating and an undercoat. However, this isn’t essential most of the time. Start painting across the top of the skirting board using the edge of the brush to ‘cut in’ with long sweeping movements. Now move onto the flat side. Load your brush and introduce it to the board, making a short vertical movement, before a long sweep with the flat of the brush along the length of the board. Work in easy to manage sections – you don’t want to be going over gloss that has started to settle, particularly if it’s quick-dry. When moving to the next section, start at the far side and brush into the section you just painted to ensure an even finish, bringing the cardboard with you to mitigate the effects of any nasty accidents. 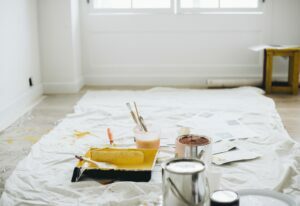 Before clearing away, check you have covered every section of the room and remove the masking tape before the paint dries. This will prevent paint from peeling away as it dries. Gloss takes significantly longer to dry than undercoat so be prepared for this – you aren’t going to complete the task in one afternoon. Avoid coming into contact with painted surfaces, and make sure the area is off-limits to children or pets. As the paint dries, it will be tacky and still has a way to go before drying completely, so leave it alone lest you put permanent fingerprint marks in your lovely handiwork! Once dry and complete, your skirting should look bright and glossy, and really lift the room. Exercise care when putting your furniture back in place just in case any damp spots remain.